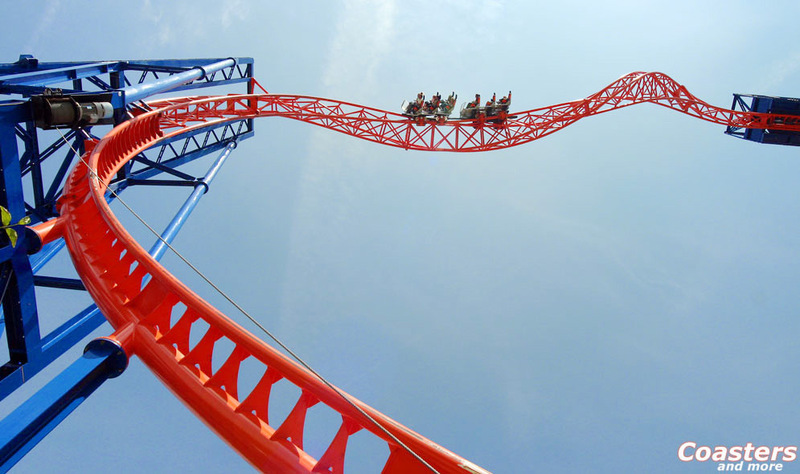 From the first idea to the complete coaster it took three years. 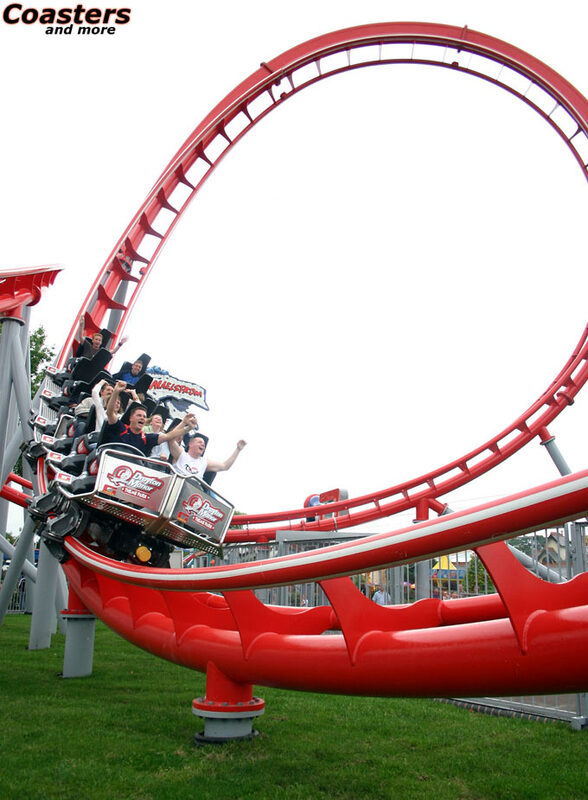 During this time the next, trend-setting roller coaster generation has been developed at the Munich based manufacturer Maurer Söhne. The result is called X-Car and offers an open car platform with clearly defined interfaces for further developments. 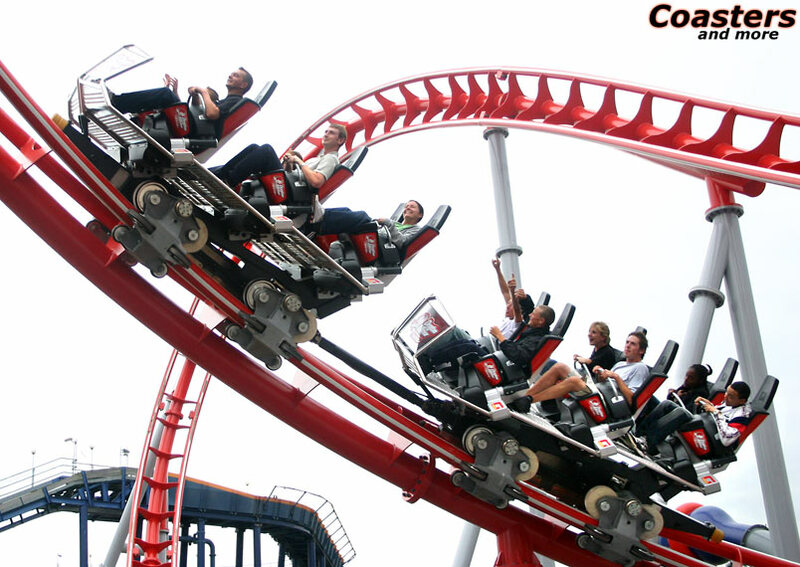 Even today sitdown, spinning, floorless, inverted or sliding coasters are possible on the same platform. The centerpiece is the ergonomically sophisticated X-Seat that offers longer upside-down times without over the shoulder restraints. 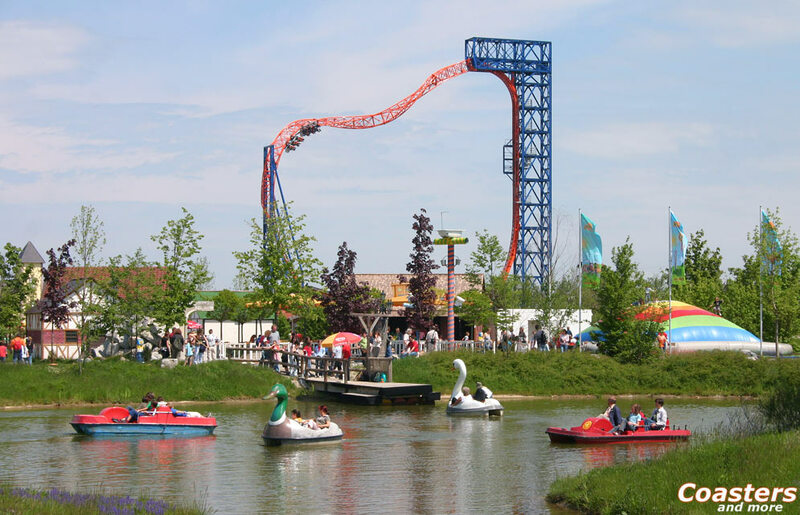 Exactly this feature is extensively utilized for the two rides at Allgäu Skyline Park in Southern Germany and Drayton Manor Family Theme Park in the UK. 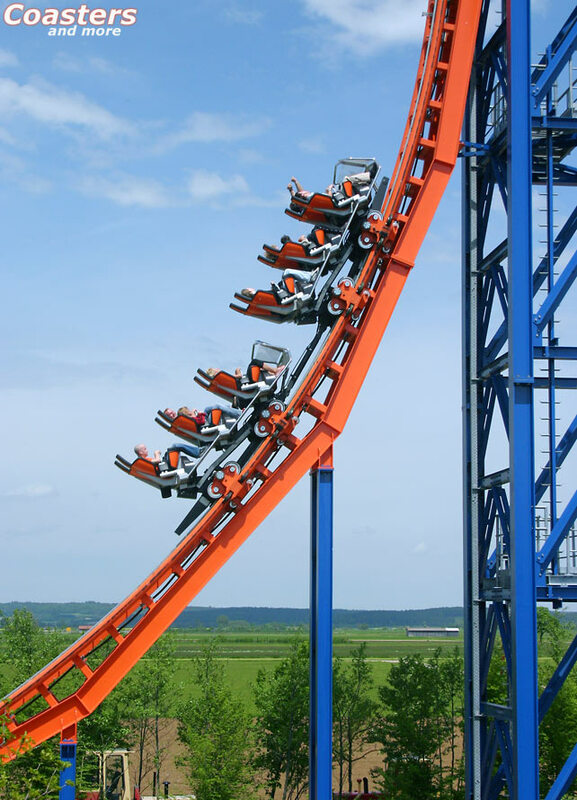 Flashback: Roller coaster development has aimed high recently - At the end of the 80s the 60 meters barrier has been broken in the US, in 2005 a 140 meters high mega roller coaster opened near New York - with a maximum speed of 210 kilometers per hour. 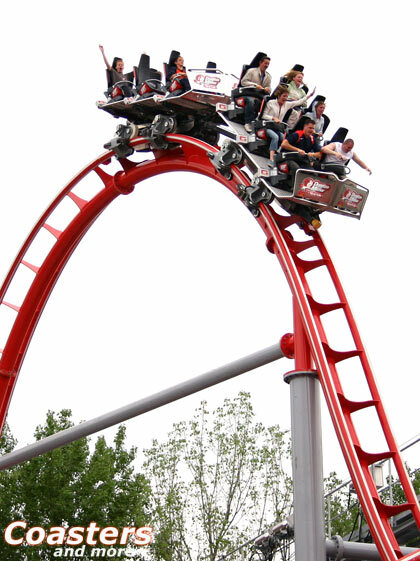 In Europe the era of mega- and hypercoasters started with the millennium, but it was over before it had gotten to full swing. 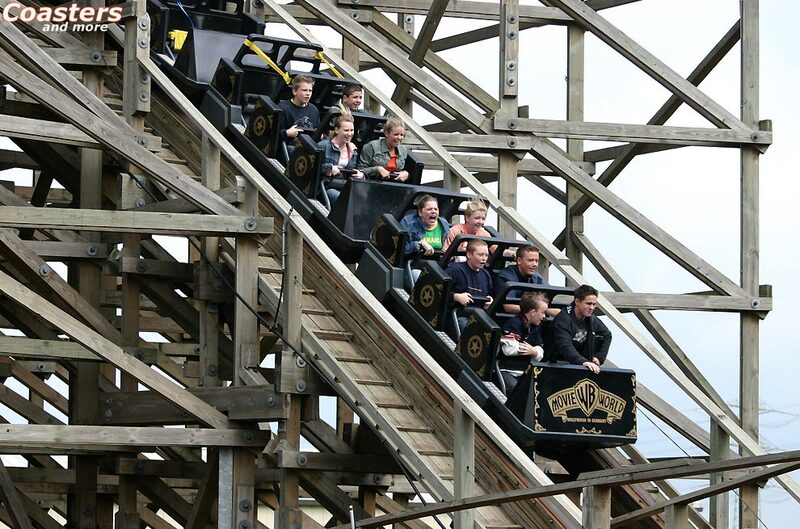 Projects like the far more than 100 meters high steel coaster for the North German heath or a giant, 150 meters high tower coaster for the Blackpool resort in the UK haven´t been implemented until today, even though the plans are ready in the drawers. 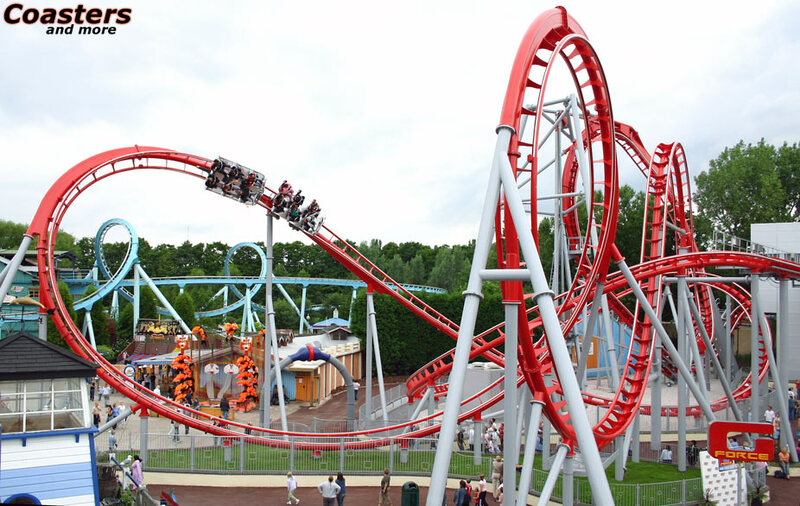 The European market demands another type of roller coaster - The best example for this is Southern Europe: Italy and Spain have their 50 meters high Bolliger & Mabillard multiloop coasters right next door, but the seats are empty most of the time. 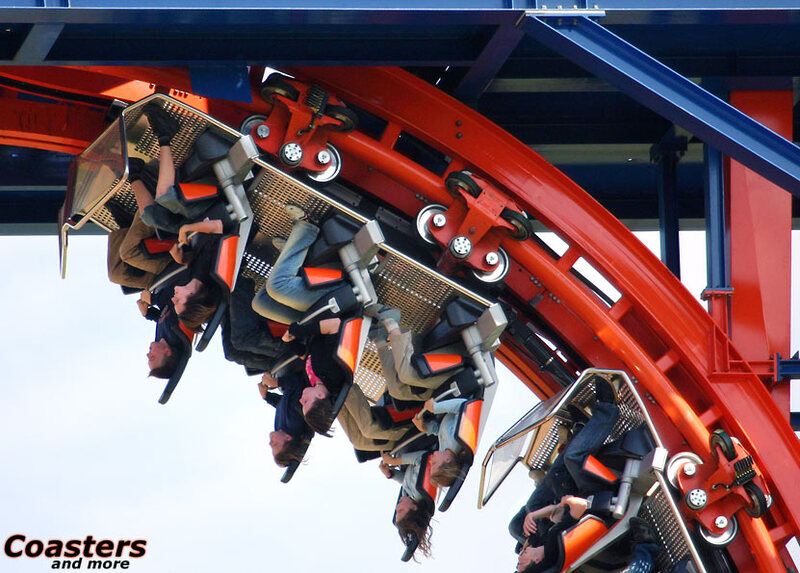 Higher, faster, further - this motto seems to work out only in the USA and Japan; in Europe compact types of rides are requested, offering thrills in other ways without occupying a footprint the size of several football fields. 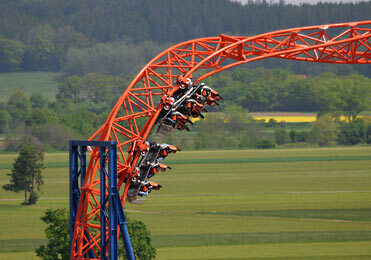 Such "brainy" roller coasters have been developed for almost ten years now at Maurer Söhne in Munich. Not far from the Olympic stadium and the adjoining BMW facilities the long-established company has its headquarters. 129 years ago everything started with innovative steel and bridge construction. 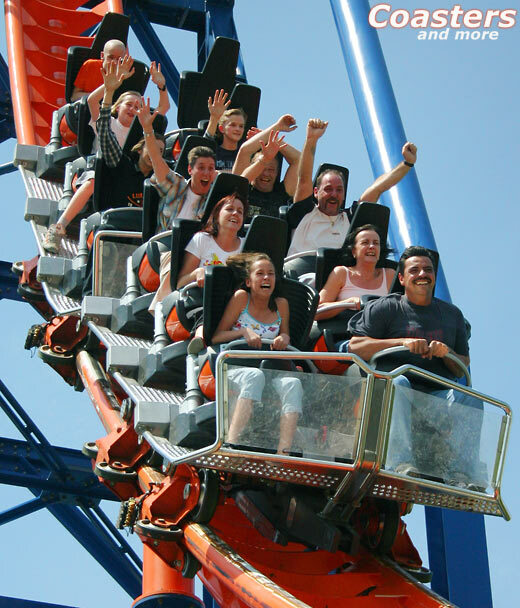 Since the mid-90s a small business unit of about 20 employees develops roller coasters with the special something. 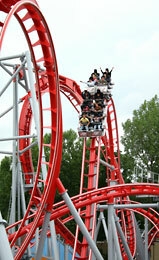 It began with the spinning coaster with single carts rotating freely but still controlled around their own axis. 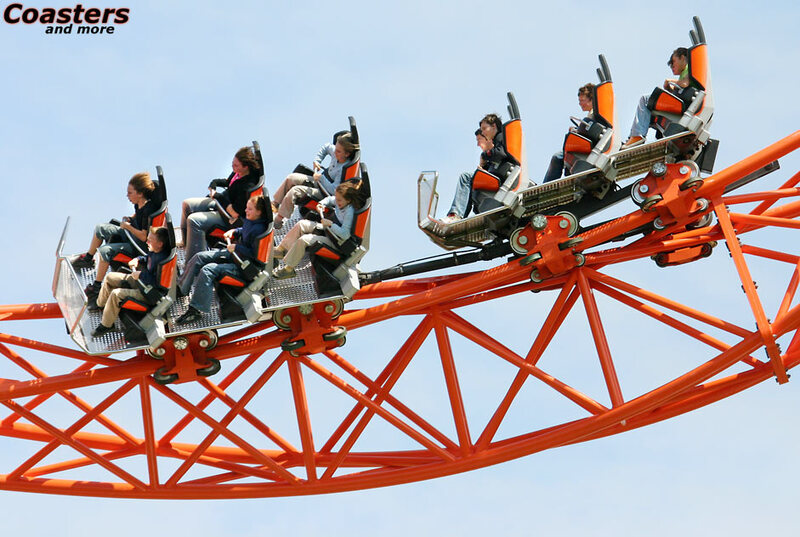 The rotation is caused only by the accelerations during the ride, so different loads cause a different experience on every ride. 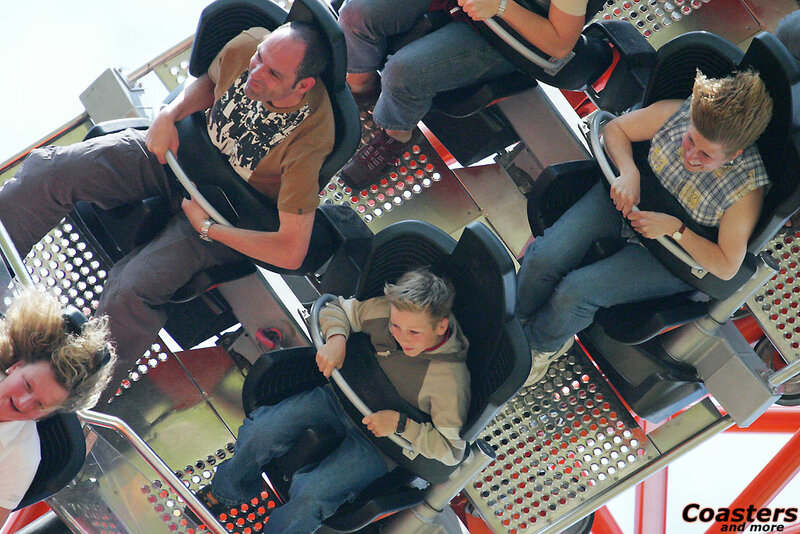 The range of sold rides reaches from traveling versions to technically sophisticated installations such as the Winja indoor coasters at Phantasialand near Cologne. 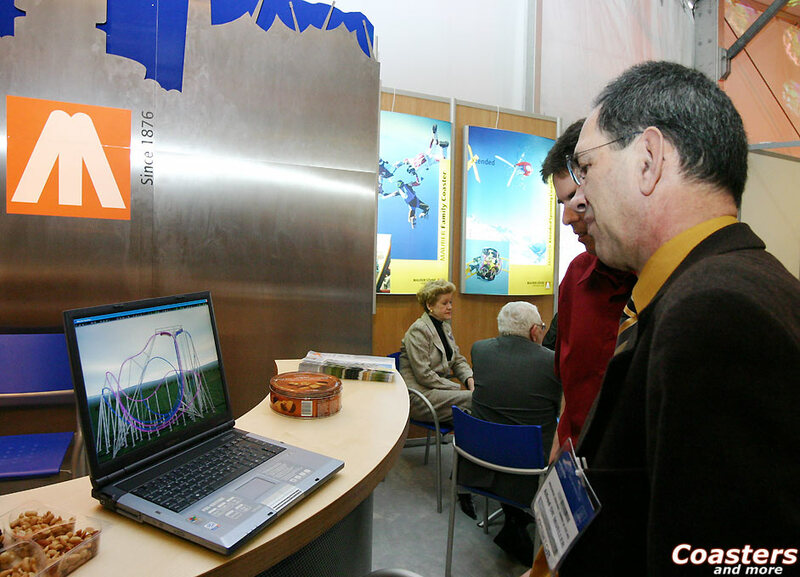 At a European tradeshow in early 2003 a completely new coaster concept was presented to the customers, being capable of bridging the gap between familiy coasters and costly thrill rides: Since then Xtended is the keyword at the steel and roller coaster company Maurer Söhne. Besides remarkable and wacky track layouts the main focus lies on a new type of vehicle that is simply called X-Car. 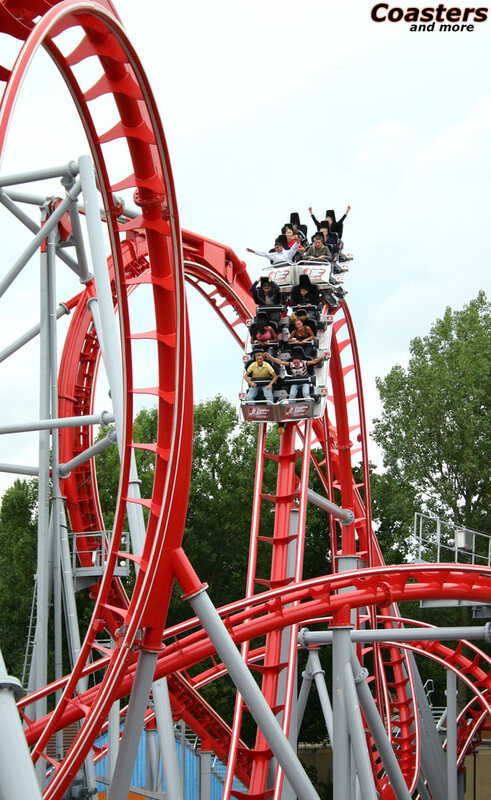 Maurer Söhne is the first roller coaster manufacturer worlwide to implement a standardized platform. "What the automotive industry has successfully established can bring advantages for our products, too", tells Dr. Alfred Müller, Head of Development. Customer requirements can be incorporated much faster and more flexibly due to the modular structure of the cars, variants are realizable by combining adequate modules and the cars can easily be equipped with future special effects. The X-Cars can negotiate the track as single cars or as train. "But we prefer single cars", adds Dr. Alfred Müller. "This allows for the design of ride elements that couldn´t be negotiated with trains." The inverted camelback, a special element that is impossible to implement in conjunction with conventional trains, for example promises a very special effect: The vehicle "underrides" a hill being upside-down. The heart of the new car concept is the X-Seat: The rider is held in the generously designed seat by a kind of lap bar. This bar is pivoted down from the side and redundantly secured by a pneumatic spring and a detent. 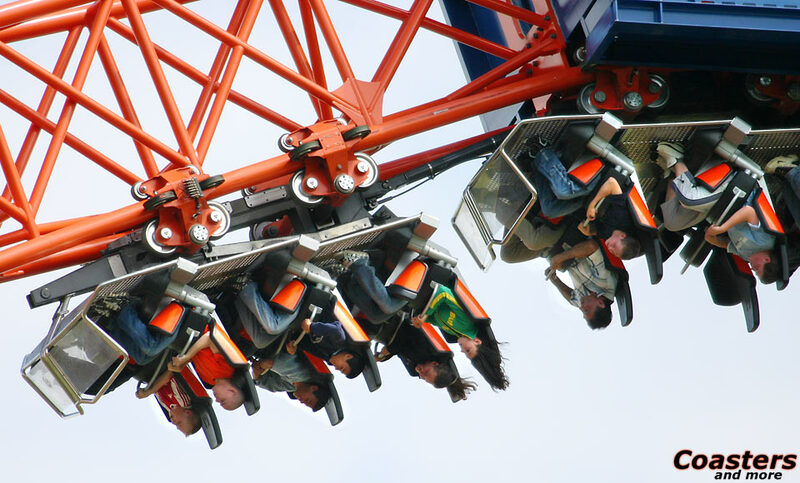 The engineers of Maurer Söhne have consciously abandoned an over-the-shoulder-restraint and developed a system that can put riders upside-down for a couple of seconds without being uncomfortable. This is mainly caused by the fact that the weight does not last on the shoulders but hangs from the lap bar and is distributed over a large contact surface. The special design of the restraint and the seat gives secure support for children from 120cm height to portly adults of up to two meters. Currently a patent is being searched for this seat concept that offers a high level of freedom with maximum safety. 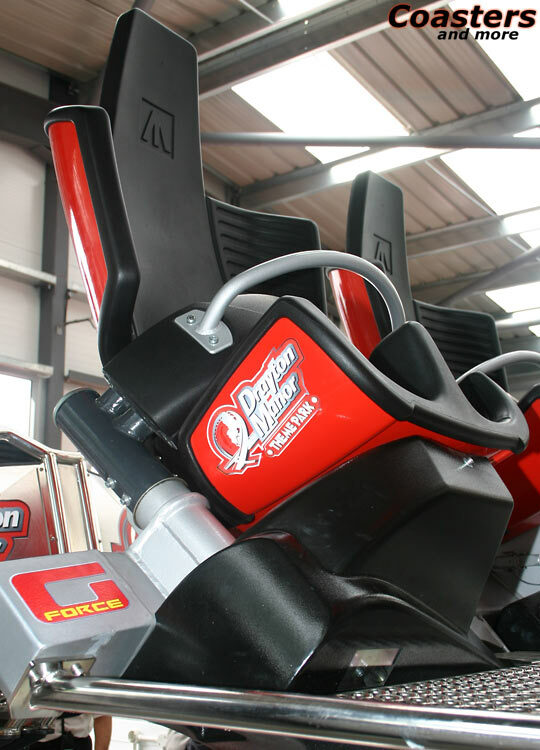 This is truly one of the most innovative developments in the amusement industry in the last years. 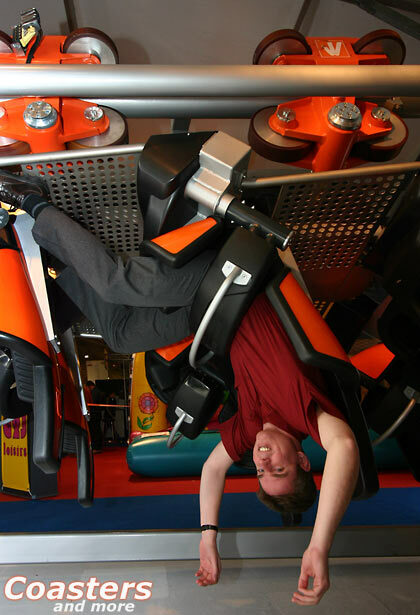 Long upside-down times at new elements now are conveniently ridable. Another unusual feature is the number of seats: The X-Car offers enough room for six passengers, and they can even outstretch their legs in a convenient manner. Dr. Alfred Müller explains: "It was our goal to offer more than four places per car to optimize capacity while using just two seats per row due to dynamic reasons. 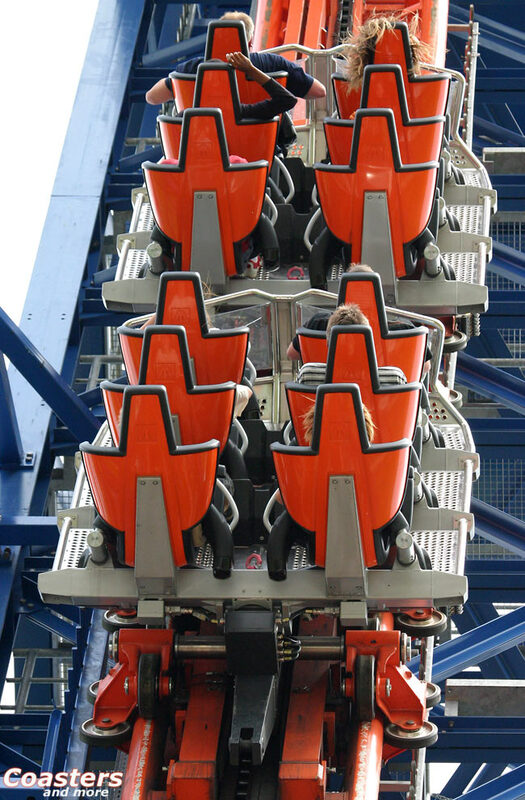 Our calculations have shown that using rows with four seats the forces on the riders in the outer seats vary by almost 100 percent, resulting in constraints in layout design. So we chose single cars with six seats in three rows since a train would not be feasible for innovative ride elements." After all it is possible to couple two cars to a tandem without having severe limitations in layout design. The characteristics of the X-Car allow for tight curves with radii as low as three meters, thus being predestined for daring layouts with extreme changes of accelerations on a small footprint. 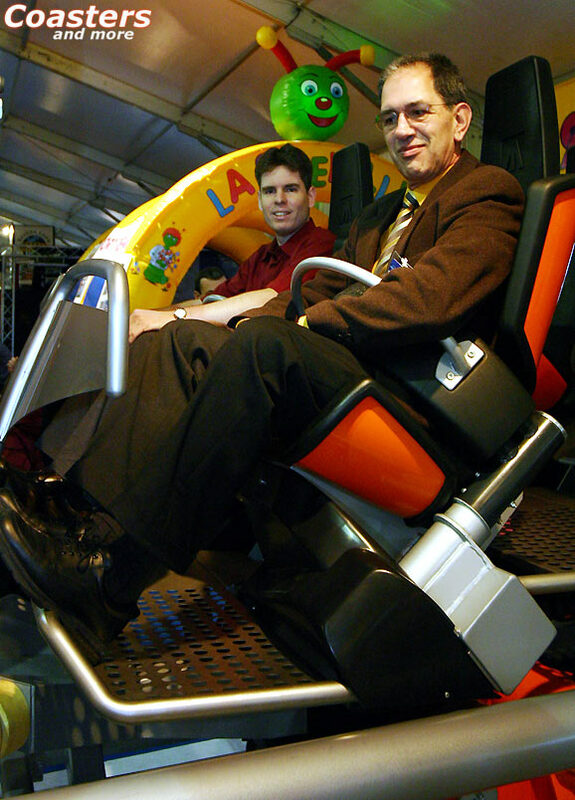 Still in 2003 the prototype could be tested by the visitors of the IAAPA in Orlando, the most important trade show for the amusement business worldwide. The X-Car was mounted on a piece of track that could slowly rotate around the longitudinal axis. 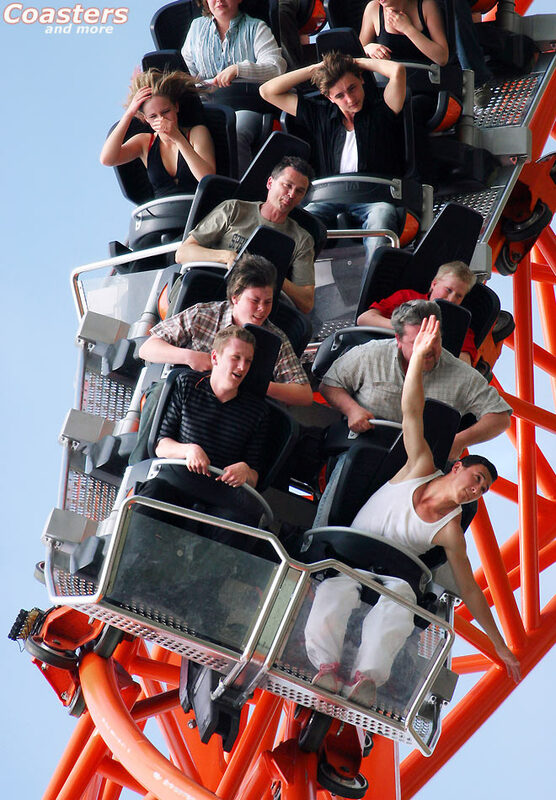 Test "rides" have shown that Dr. Alfred Müller hadn´t promised too much: Even a headstand of 30 seconds was no problem from an ergonomic point of view. Maurer Söhne earned the highest respect from potential top-class customers like Walt Disney Imagineering, Gary Story of Six Flags or Paramount. "We have to show the customers that our small, agile cars can offer more thrill than a titanic giga coaster", Robert Getter, Head of Construction, has explained during a visit at the Maurer Söhne facilities. This became possible by a prototype that could be tested close to Munich. 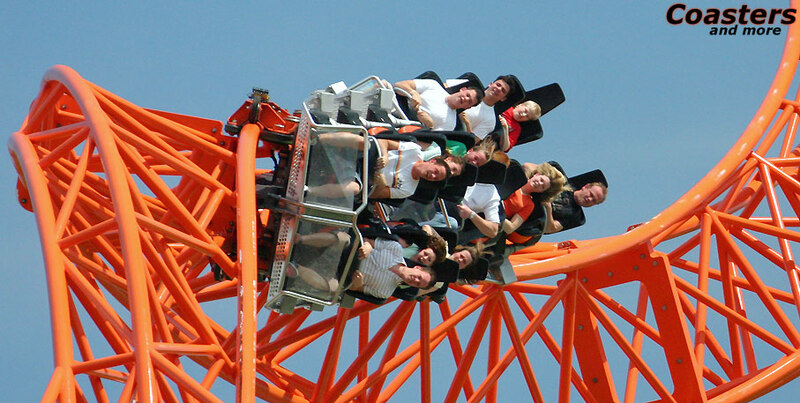 With the Allgäu Skyline Park and its owners, the Löwenthal family, in spring 2004 a partner was found who wanted to put the ride into operation the same year. The prototype should have been built within five months - a schedule that couldn´t be met. 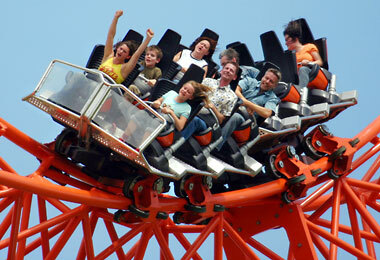 So the SkyWheel opened with the 2005 season. 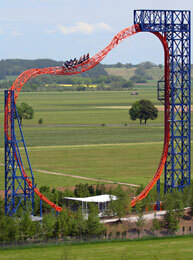 It impresses not only by its spectacular appearance, but also by an extreme ride experience. Looking like a giant wheel without a spoke or hub, SkyWheel is enthroned high above the Skyline Park. 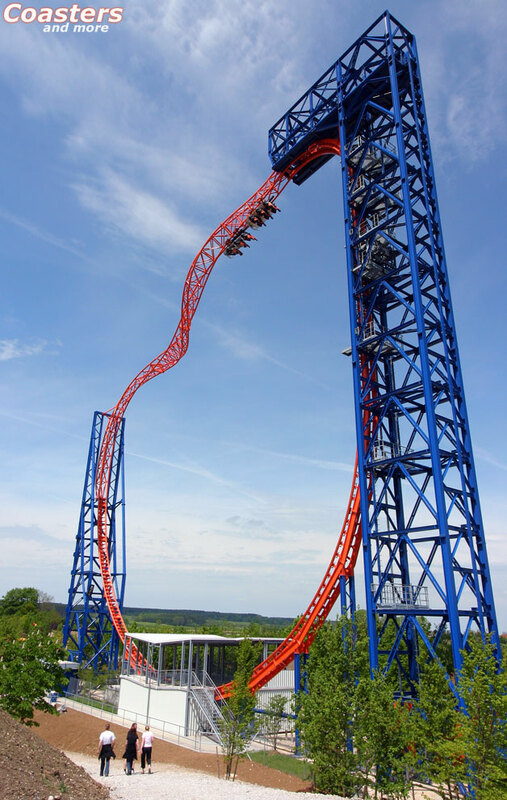 The more than 40 meters high oval comprises the extraordinary Humpty Bump Lift that initiates the first inversion and a descent with a heartline roll that finally leads into the station after a vertical arc. The whole construction shows a curious design, but it sets new standards - just like the ride experience does. The vertical Humpty Bump Lift is attached to a 51.2 meters high steel tower built in latticed framework, whith the upper end holding a short arm. This arm accommodates the lift system and marks the beginning of the spiral inverted track. In this section the car winds around its own axis in a screw-like manner. First it hangs upside-down, then in the horizontal, and finally it goes upside-down again - an inversion in the loop, so to say. The spectacular track structure is absolutely self-supporting on a length of 53 meters between the lift tower and the conventionally shored up vertical arc. As unconventional the structure of the lift looks, as elegant is the uppermost piece of track nestled around the imaginary heartline, thus resembling a whirlwind winding around its eye. 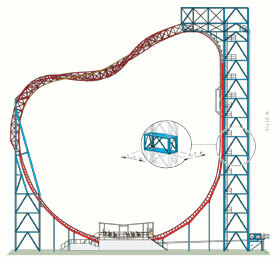 With a diagonal of almost two and a half meters the four pipe track has quite an extreme cross section which seems relatively small since it is attached sky-high. 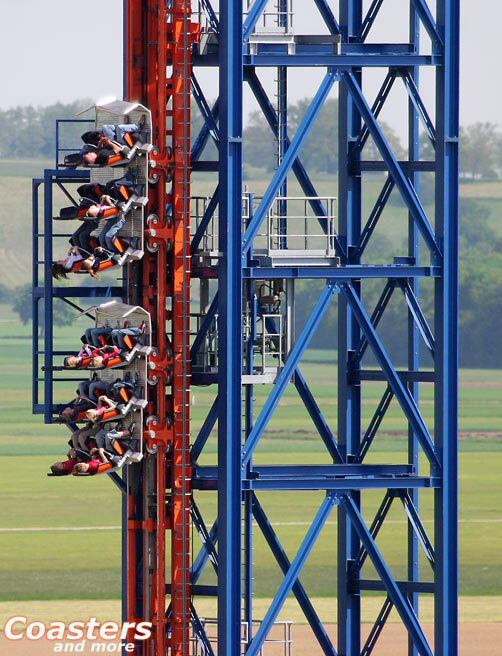 The passengers are pulled up vertically, lying on their backs, before they enter the Heart Roll in a height of 40 meters in slow motion, performing a quarter backflip. 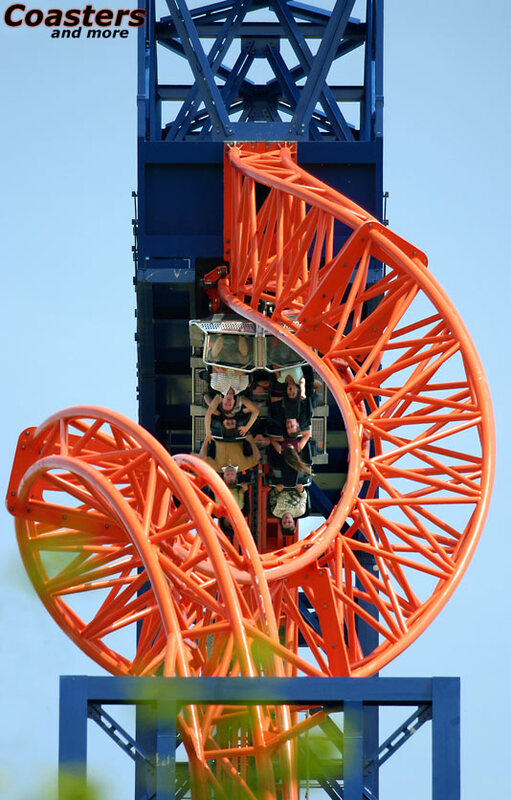 Here they experience a very special optical sensation, looking about 50 meters through the center of the Heart Roll just up to the following drop. This view is quite short-lived, since the cars are quickly spun by 360 degrees around the heart line with increasing speed. 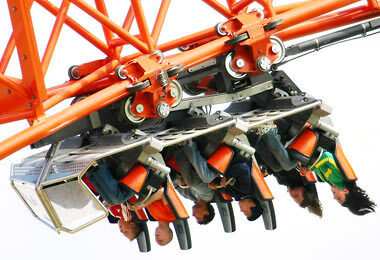 The riders are upside-down again to drop the last 30 meters with up to 105 kilometers per hour. 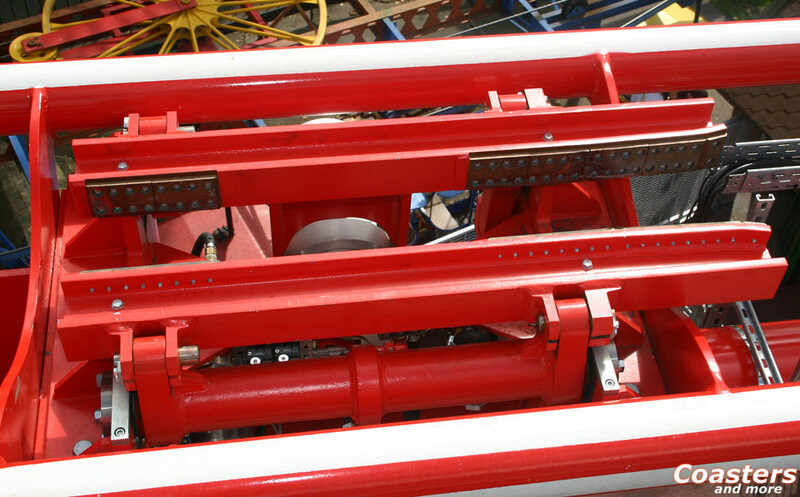 Unlike many other rides SkyWheel has no strong magnetic brakes in the station at the bottom of the oval. 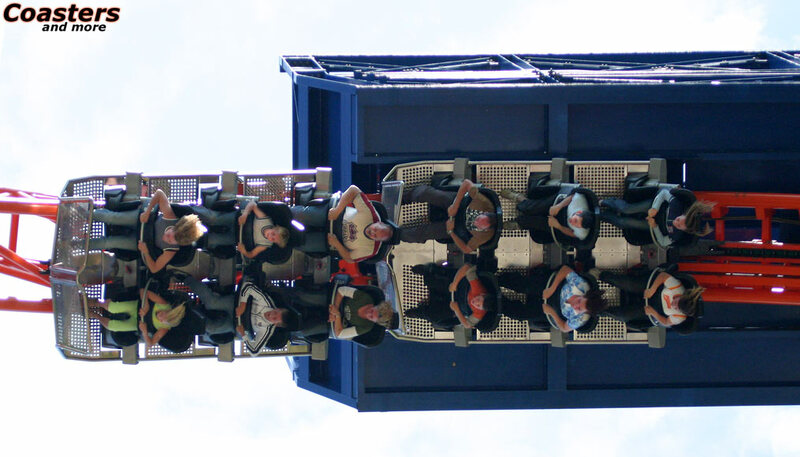 Instead, the train shoots up the vertical Humpty Bump Lift, the front even reaches the vertical radius putting the riders almost upside down again. At the top dead center the car seems to pause for a couple of seconds before gravity pulls it right back towards earth, starting a spectacular pendulum movement. First the train shoots backwards through the station with 5g pressing the passengers into their seats once more. Then the cars shoot up again what seconds before has been the main drop, even reaching the spiral at the upper end so that the back rows experience some serious banking. The X-Seat pays off here since the upper body remains conveniently held while winding backwards into the Heart Roll. The train drops down again, rushing forwards through the station before the about 60 seconds long trip ends on the Humpty Bump Lift with a puissant jar caused by a mechanic stop brake. The chain takes on the train and carries it back to the station. 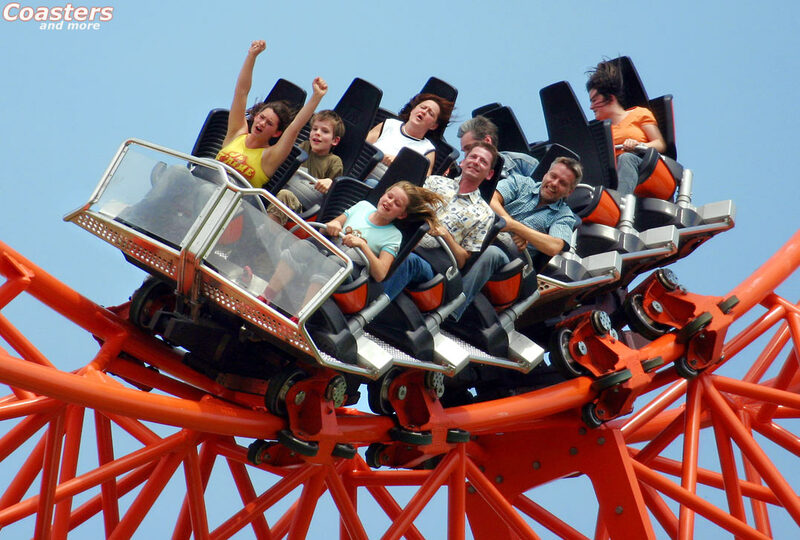 Back on earth it becomes rather obvious that a ride on SkyWheel demands a great deal of the body - the maximum acceleration of 5.3g on passing the station is quite extreme, and the alternating pendulum movement still intensifies the experience. 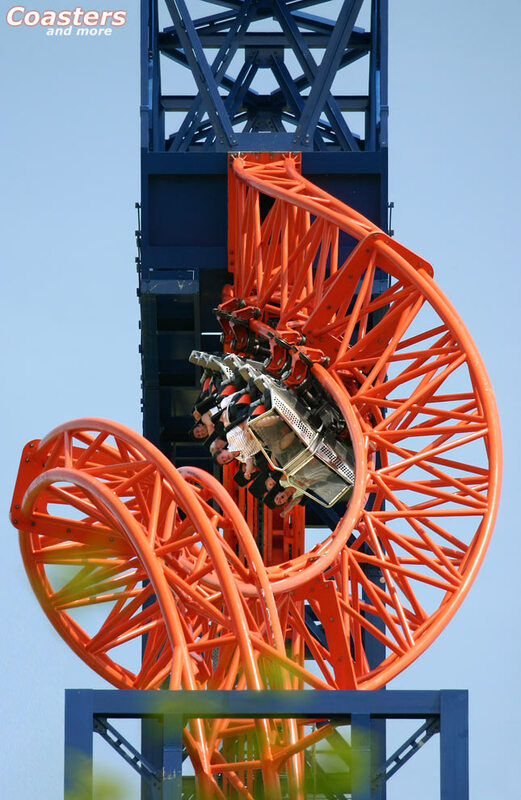 Despite its tame look SkyWheel is a first class thrill machine that can even be extended to a complete circuit, with a block brake and multiple trains, in two stages. A first model looks very promising, and according to Joachim Löwenthal, the owner of Skyline Park, the first extension stage will be implemented in 2007 if everything works out. 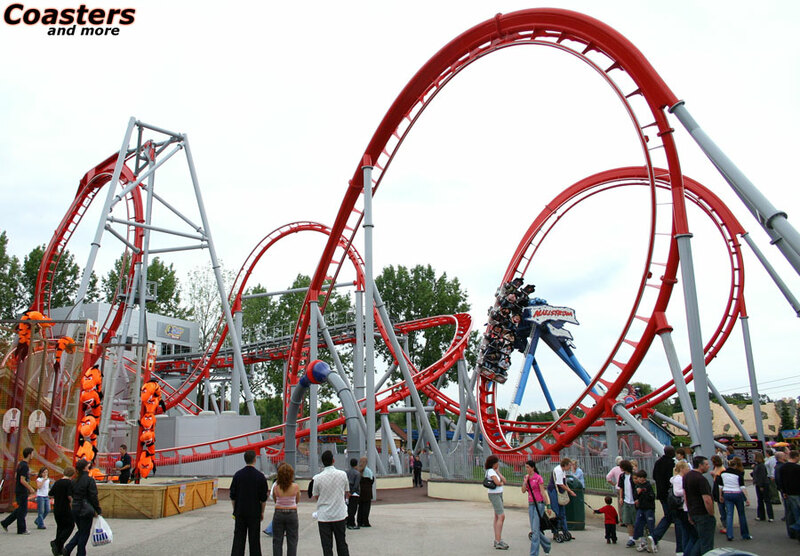 Another SkyWheel, together with the first extension, will shortly be built at Parque de Atracciones in Madrid. 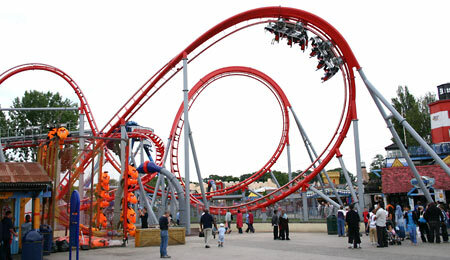 There the train will pass the station after the drop, negotiating a Half Cuban Eight, a camelback and an Immelmann turn before it comes to a stop on the lift and is brought back into the station. 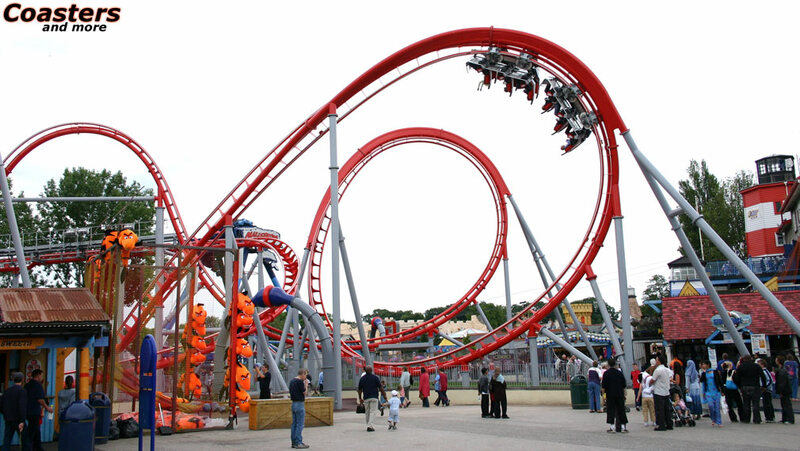 Change of scenery: We are now at the notoriously gray United Kingdom where G-Force, the second X-Coaster, has been opened to the public at the end of July 2005. 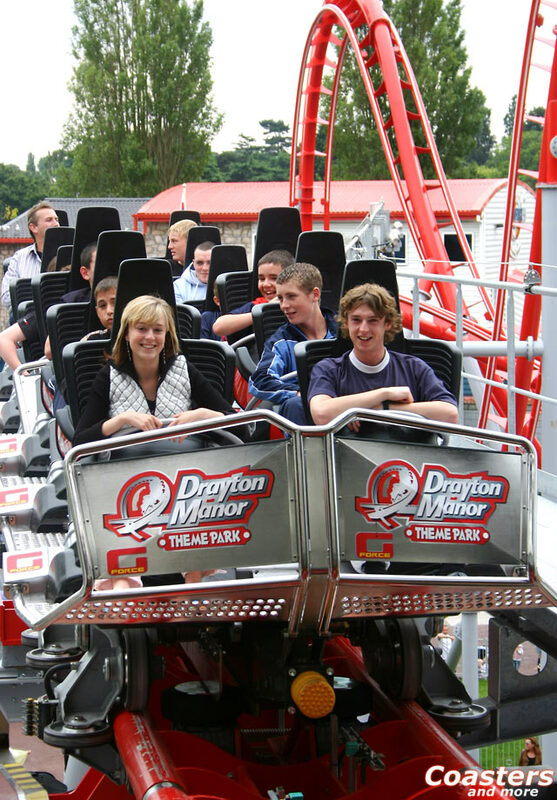 While the prototype at Skyline Park with its "vertical ride" concept offers maximum fun on a towel-sized footprint, Maurer Söhne have implemented the second delivery to Drayton Manor as a classical roller coaster with three inversions, steep turns and an extreme, parabolically shaped camelback. 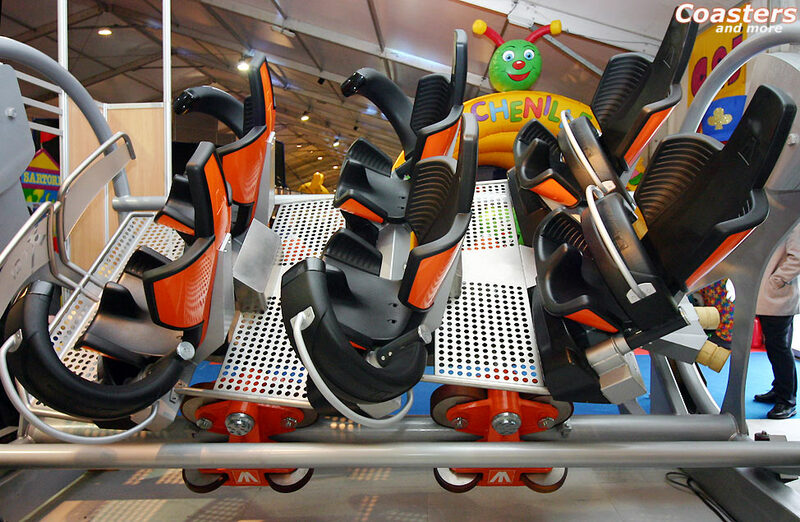 At G-Force, too, the unique lift concept causes some furore: The modified version of the Humpty Bump Lift puts the cars upside-down while carrying them upwards, thus causing a new dimension of thrill. 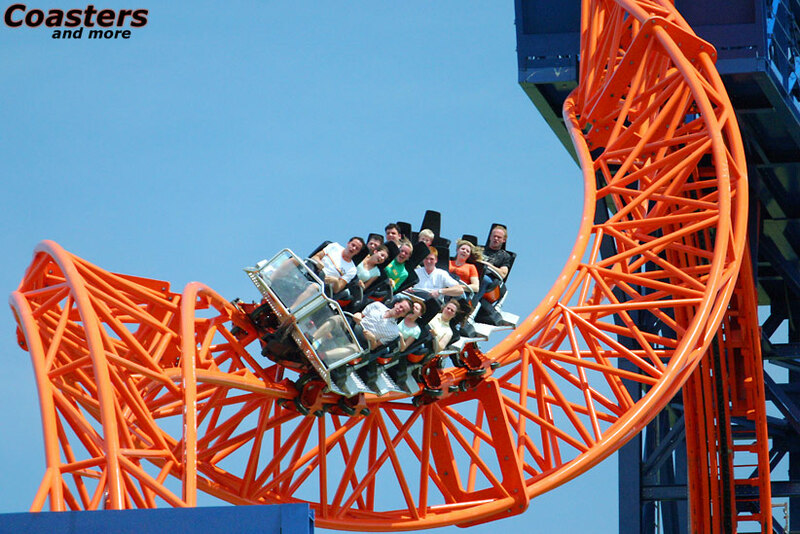 Until last season a small looping coaster from Italy occupied the area, now G-Force with 385 meters of track and a maximum height of 24 meters replaces the old ride. 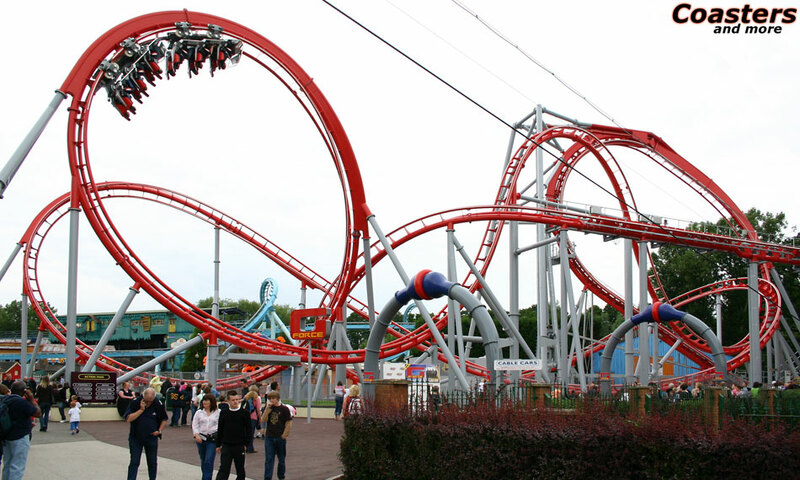 Those are no impressive stats indicating a real thrill machine - If the layout wasn´t so odd that some ride elements seem simply unridable. The best example is the extremely jolted camelback immediately following the Humpty Bump Lift. G-Force is highly unusual in every respect. This begins with the theming compared to the surrounding attractions: While the water ride Stormforce 10, the giant pendulum Maelstrom and the standup coaster Shockwave are dedicated to the forces of nature, the modern new entrant from Munich with its red track and the silver station of corrugated iron seems like a foreign body. 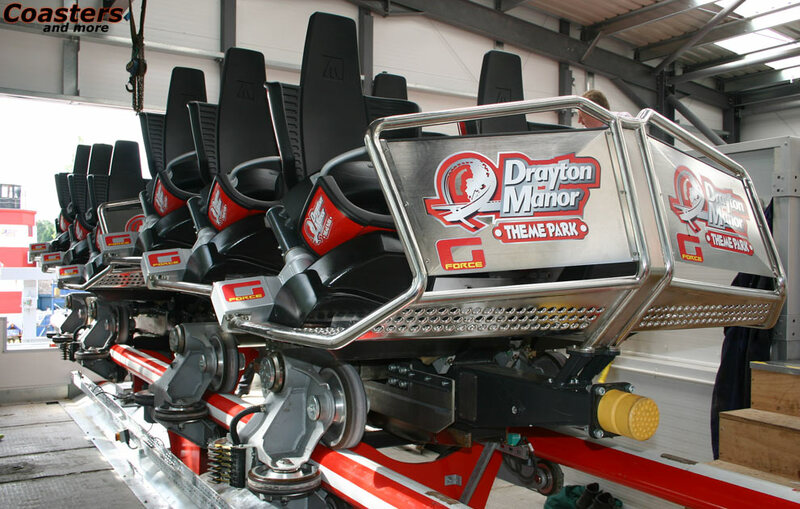 "The modern design of the seats and the cars has coined the entire concept", says Colin Bryan, Managing Director of Drayton Manor Park. 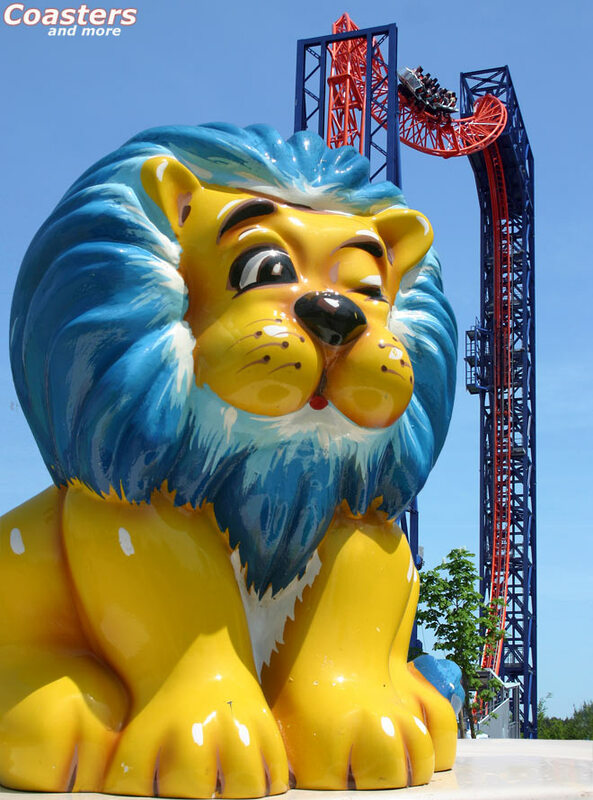 "With the new millennium came new ideas, and we wanted the new roller coaster to optically stick out." The modern look continues at the interior. 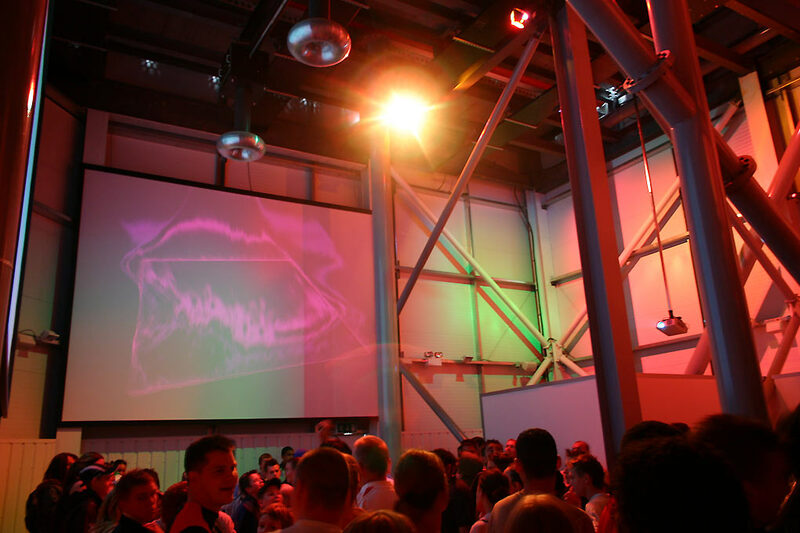 Those waiting are entertained by abstract video projections and loud techno music that was specially composed for the ride. Every seven and a half minutes an electric arc discharges between two rings under the ceiling, thus further raising the expectations of the waiting people. 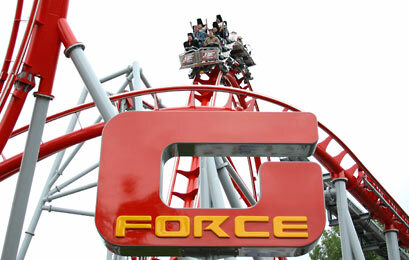 G-Force challenges the senses before the riders have clambered the station. Clambering the station? 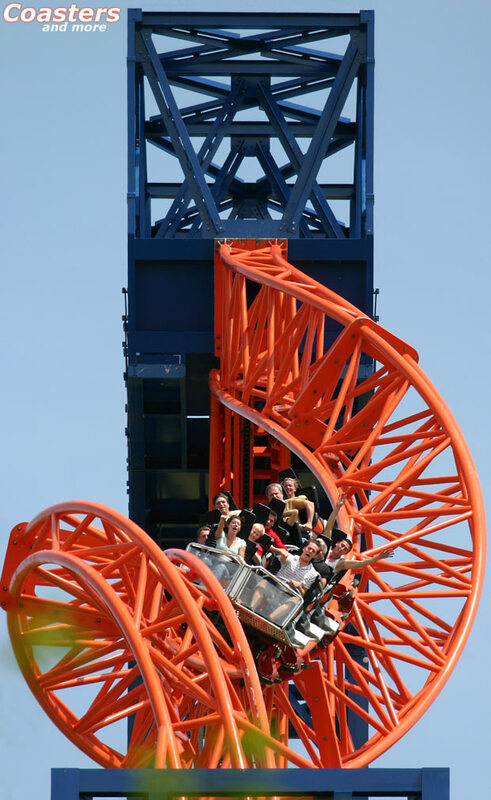 Correctly, just like at the Intamin looping coaster Shockwave the station platform is high in the air - ten meters above the ground, to be exact, and thus 8.5 meters above the lowest point of the track. At the station platform there is a great view to the right on Maelstrom, where especially the female teenagers scream in time with the swinging. Just like the rest of the ride G-Forces´s station is quite modern, almost futuristic. This look was inspired by the design of the X-Car: An elaborate GFK body has been abstained from, the focus lies on the voluminous X-Seats girded by a metallic tube frame and a stainless steel floor. The latter is almost on the same level as the station floor, enabling a fast and unobstructed boarding. Speaking of unobstructed: Using an elevator even disabled persons can easliy reach the station. And another group has been thought of, too: The last row of each car has a "Big Boy Seat" for people with larger upper body dimensions. The seat has been extended by a few inches to the front and the restraint has an extended, monitored closing range. Convenient it is, the new X-Seat. Almost luxuriously convenient, one may say, but as soon as this thought is thought, the friction wheels push the train out of the station right into a left curve. 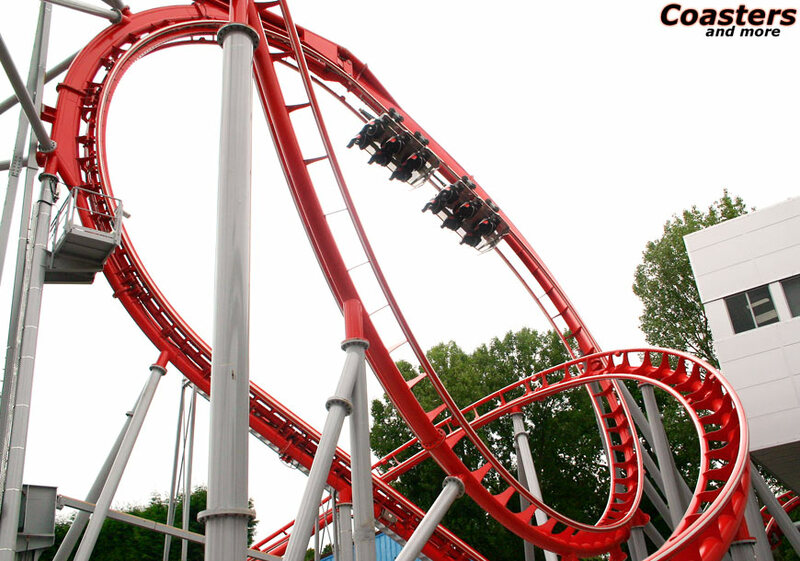 A small drop follows, giving a taste of the upcoming ride with some airtime especially in the back seat. 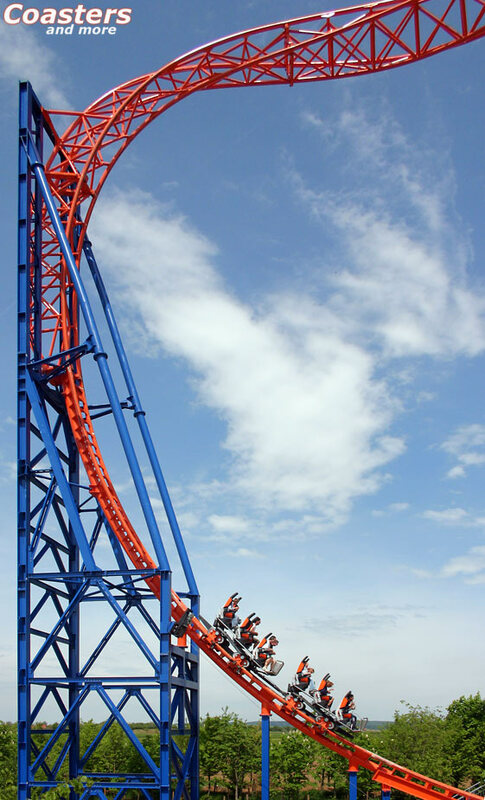 But depending on the body build, this may have been the last airtime moment, since it may well happen that the restraint closes a little more and keeps the rider "safer" than he might want to. Maurer Söhne is aware of this problem and the engineers work on a solution that is suposed to be included in future installations. 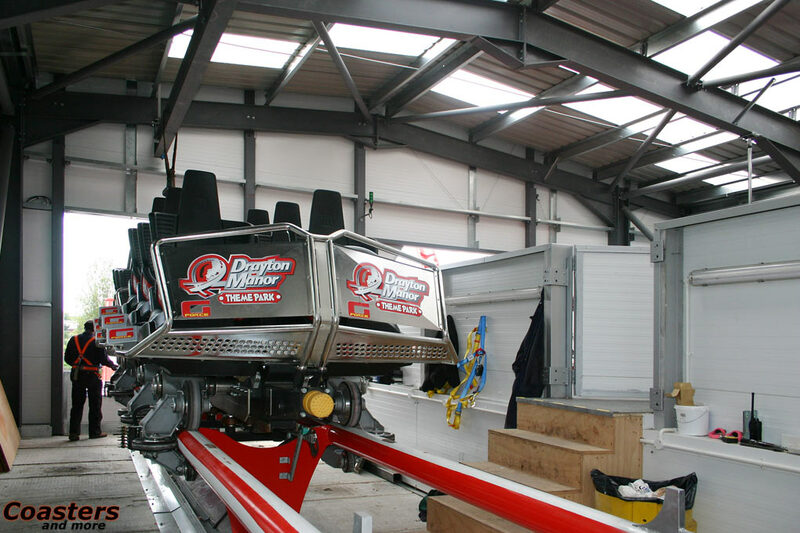 It follows the particular Humpty Bump Lift which is actually less of a disdainful lift that only serves to supply the train with enough energy for the rest of the route, but can be considered as a self-contained ride element. Compared to SkyWheel it looks like a deformed vertical loop whose first half up to the crest is provided with a chain lift. 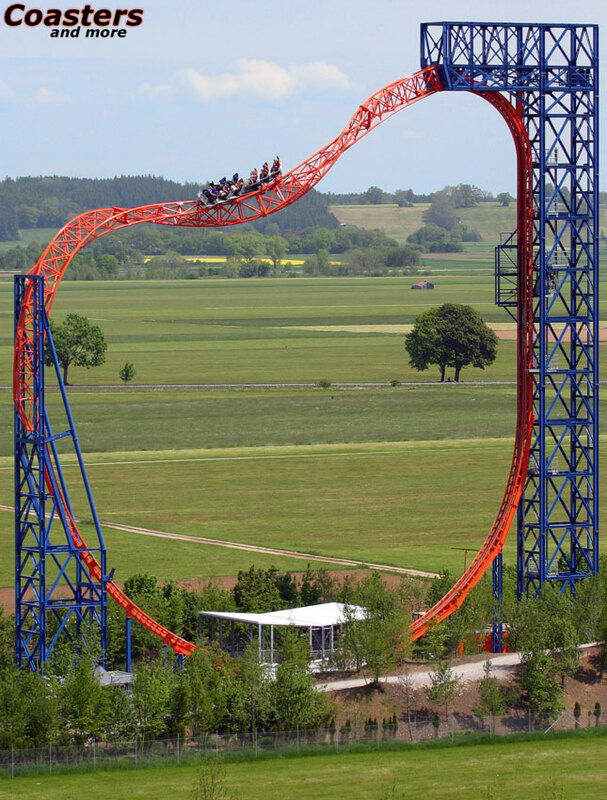 From the bottom first a slant leads to half the height, then an almost circular arc of approximately 180 degrees follows, leading the train into a short upside-down descent. 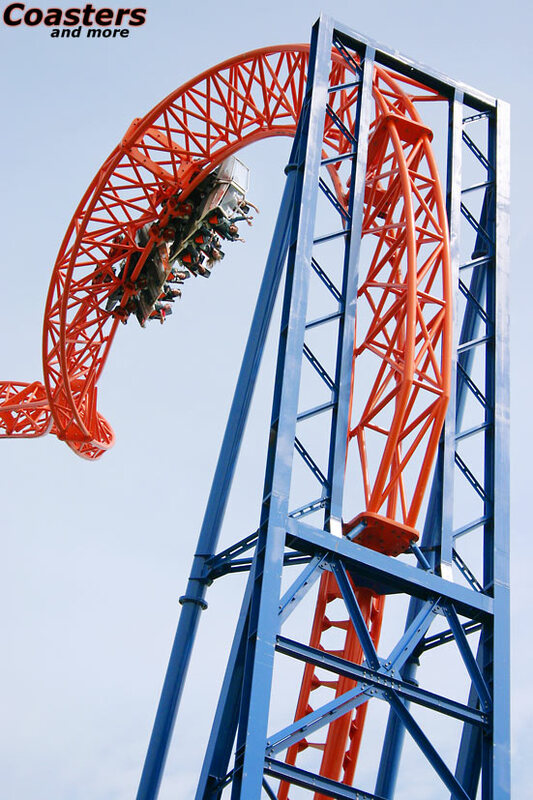 This "drop" is a very unique experience: The train accelerates heads-down towards mother earth and glides into a horizontal position at the bottom in a wide arc; the first inversion is thus completed. Noteworthy is the canal running parallel to lift chain, since this canal houses another chain. In case of a power failure it is used to bring the train either back onto the slant to evacuate it there or to push it far enough into the lift so that it negotiates the rest of the course as planned. The energy needed for the additional chain is provided by an electric generator in the power house below the lift. 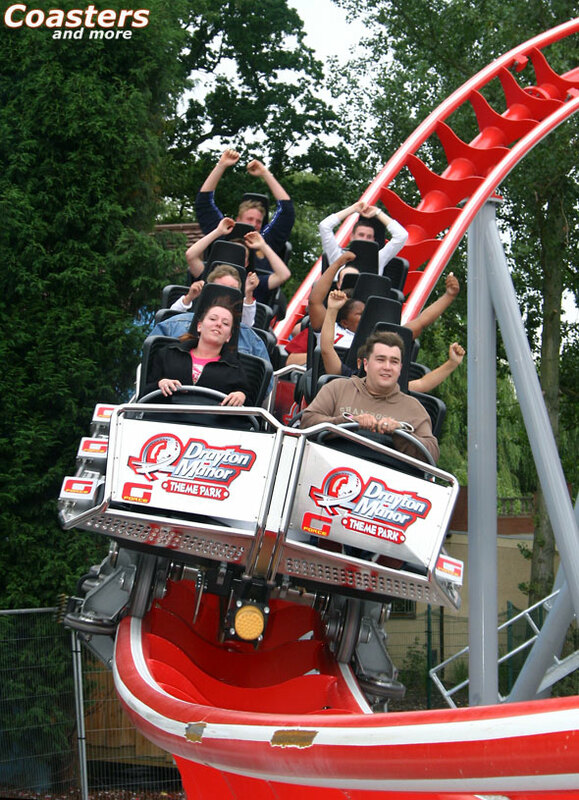 G-Force the second X-Car delivery, installed at the Drayton Manor Family Themepark in the UK. 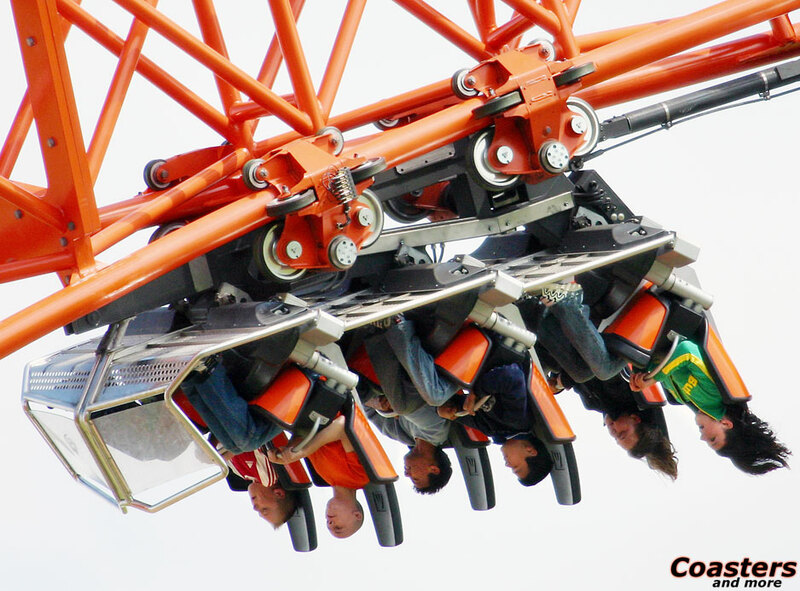 On just 385 meters of track the ride offers such unusual ride elements as the Humpty Bump Lift, an extremely compact camelback and the new inversion Bent Cuban Eight. 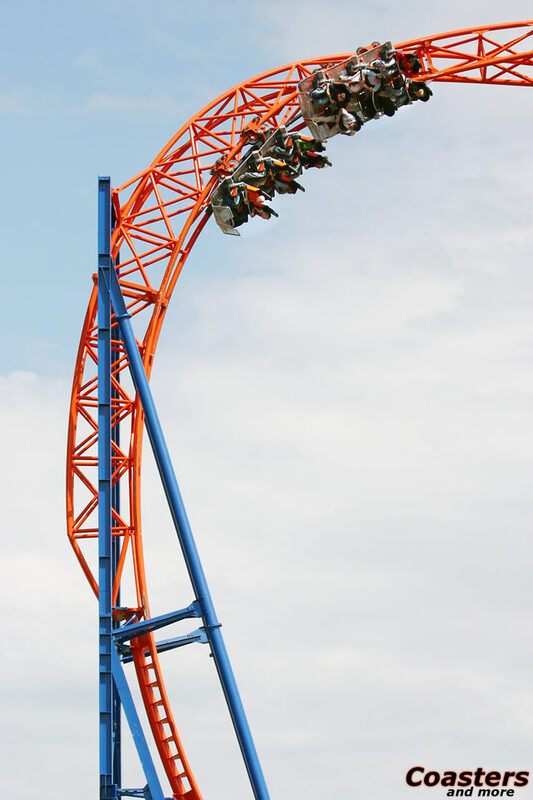 While the Humpty Bump Lift - at least its first half - was still quite easygoing, G-Force now shows the strengths of a compact layout with highly unusual ride elements. At first there is an artime hill: Intrinsically a known figure if there weren´t proportions far from every standard. The ascent and descent are quite steep, and the top is very short. 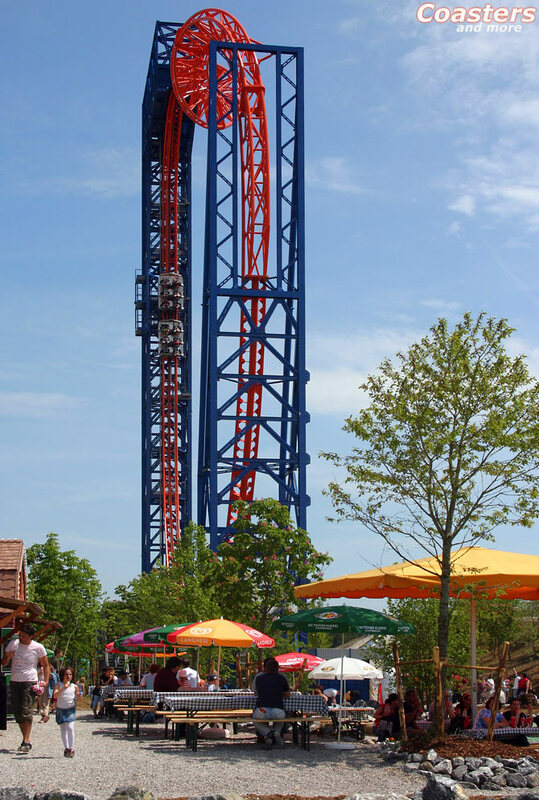 Once the ride will be run in in a couple of months, the airtime at this point will get even more intense. The next element, the Bent Cuban Eight that resembles a stunt flying sequence, can´t be compared to any known figure. 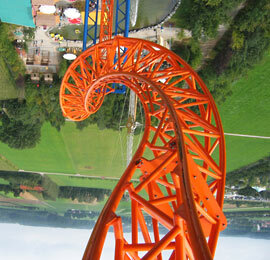 The first part is similar to a vertical loop whose exit shows a sidewards angle of 45 degrees relating to the ascent. 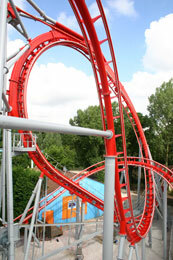 With this angle another half loop is approached, and from its highest point on the train unscrews counterclockwise from the headstand while going down - here is a slight similarity to a B&M Immelmann. 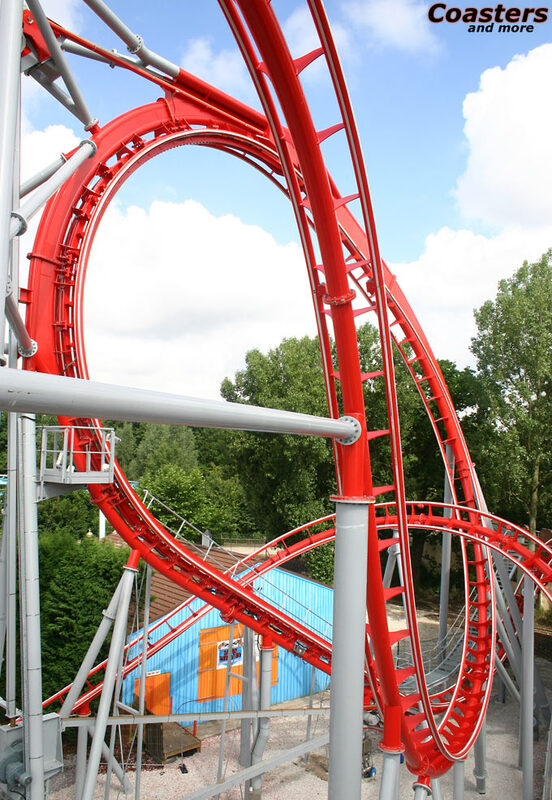 The end of the 385 meters long track consists of a short left curve close to the ground, a highly banked left turn and a swooping ascent into the final brake, which for the first time for a Maurer Söhne coaster has magnetic brakes in addition to friction brakes. Due to the elevated station the brake run could be held quite short, for the train looses a serious amount of momentum on the ascent. 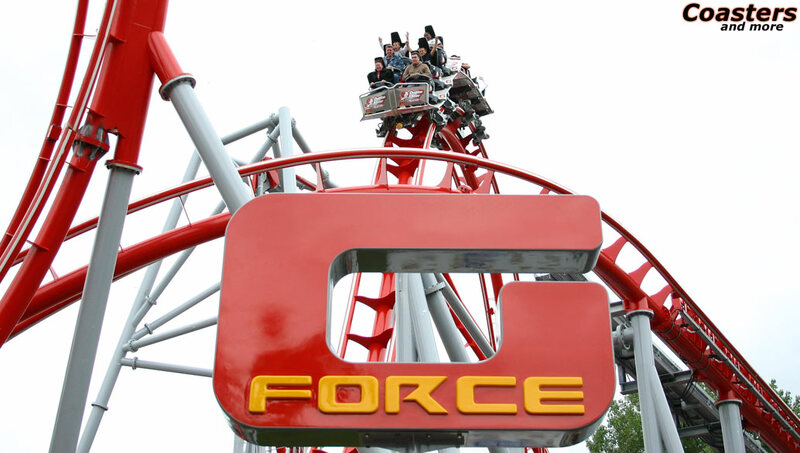 G-Force shows how much innovative fun is possible even on a very small footprint. "The compact design was one of the main reasons for choosing a coaster from Maurer Söhne", says Colin Bryan. "Another reason was that the ride is approachable from almost every direction, thus giving an exciting experience for non-riders, too." Standing on the path under the exit of the Bent Cuban Eight it seems that the riders are within easy reach. 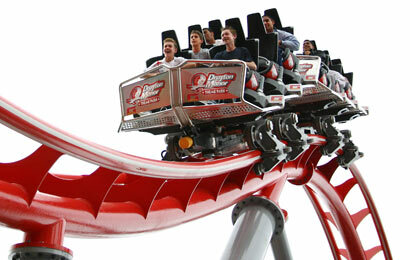 With the patrons G-Force is so popular that the park thinks about buying a second train for the next season. 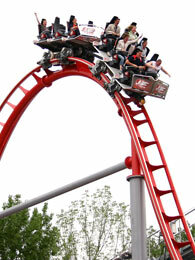 The steel track was realized using the in-house software tool XTRAC which allows track design with just a few mouse clicks on the computer. The program which was developed during a long-term cooperation with the University of Duisburg unites track design, calculation of dynamics as well as statics and production preparation in just one user interface. 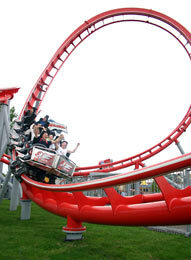 XTRAC can be seen as the perfect addendum to the X-Car coaster. The high speed at developing a layout as well as the many visualization possibilities allow for a very flexible response to customers´ needs. All services from the first draft to the initial operation can be provided in-house without the need for external legwork. The specialty of XTRAC is the precise real-time calculation of the dynamics done by a software module in the background while the layout is being designed. 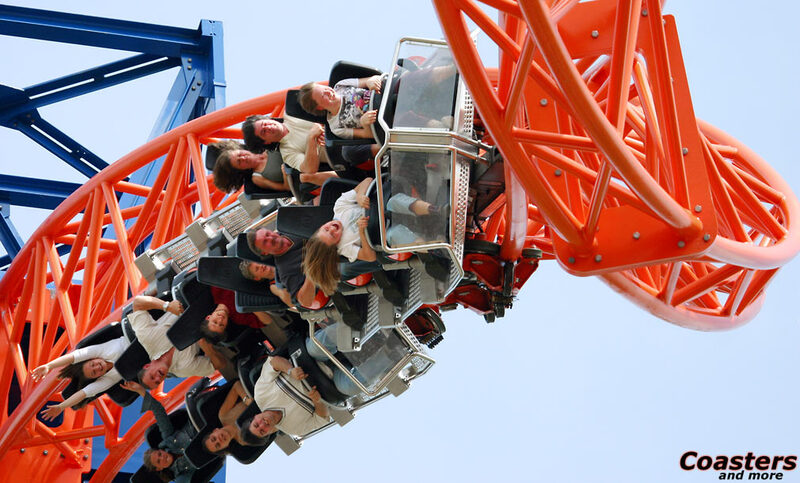 The automated optimization, which can be manually influenced at any time, not only reduces the forces on the riders but also allows for new ride elements or those with extreme changes in direction and curvature - as they are implemented, for instance, at G-Force. 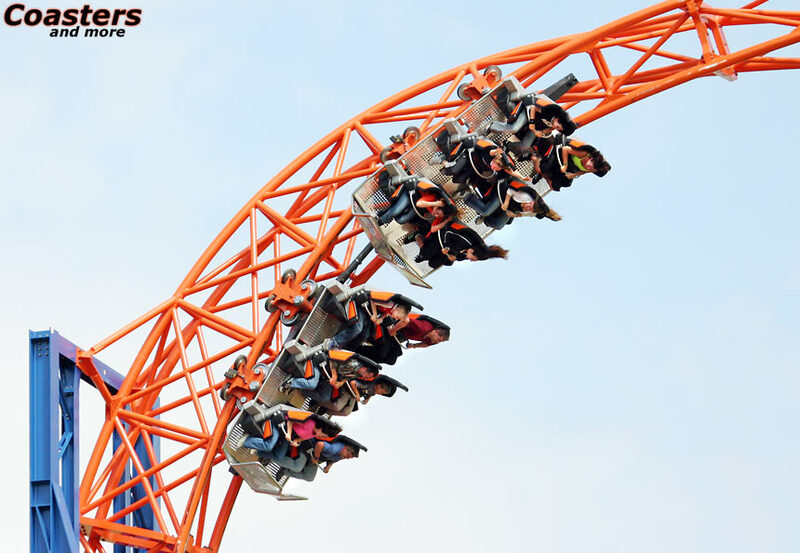 At Maurer Söhne the focus lies on the ride experience - convenience and thrilling track combinations replace the desire to build mammoth construcions. With XTRAC the ride can be simulated with any kind of vehicle and be optimized for any application and type of car. 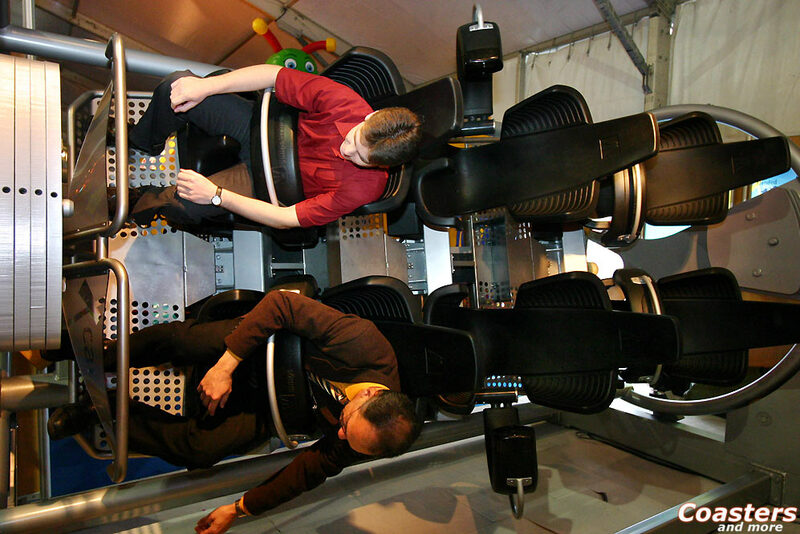 A couple of rides have been developed so far using XTRAC with internal resources only. This is the only way to optimize all design stages. Especially with challenging terrain or when integrating a ride into an existing infrastructure XTRAC brings many advantages since exact data are used as early as in concept stage. 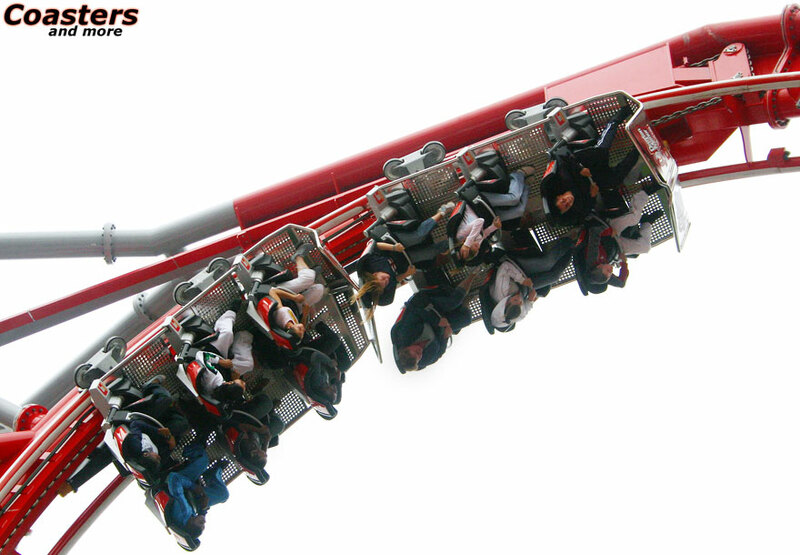 This was particularly advantageous for the spinning coaster Tarantula for Parque de Atracciones in Madrid, Spain. But for developing completely new elements XTRAC is an essential tool. In the future the capabilities of the software will be further extended: Maurer Söhne are currently working on an automated interface between XTRAC and the existing tools for static calculations, thus leading to another increase in efficiency and technical optimization. 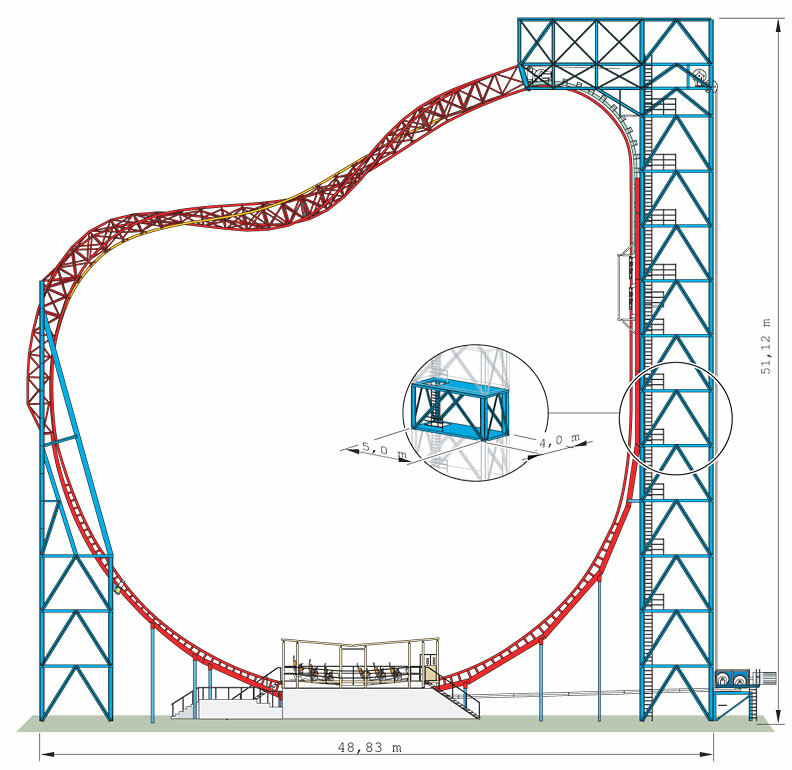 Coastersandmore: Which were the reasons for developing the X-Car? 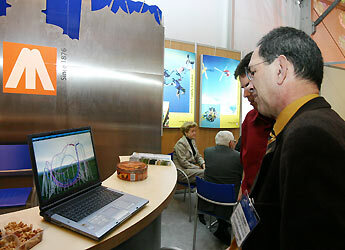 Dr. Alfred Müller: The basis was a marketing study we have made concerning future developments in the coaster sector. 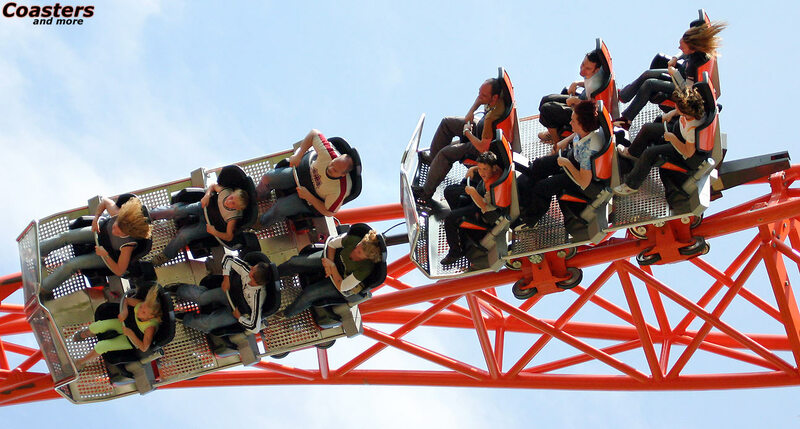 Based, among other things, on surveys of fans and park operators we came to the conclusion that being able to experience negative forces without over the shoulder restraints would be a desirable goal. It was clear from the beginning that we would have to break new ground and part with old ideas and solutions. What was the development process like? What was the main focus? Since we have developed from scratch we had the chance to design the whole vehicle according to the latest state of the art. Additional demands like maximum agility, the highest possible convenience and exceptional design could be considered from the beginning. An essential point was to achieve a high degree of modularity to cover a wide variety of car variants with the basic development. But the main challenge was the design of the restraint system. We were able to develop independently from any actual project and with a sufficient budget, so every design step could be performed in an ideal way without cutting back with regards to time or cost. 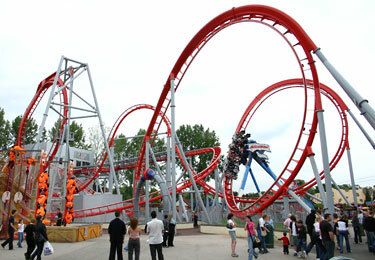 Right now you have rolled out two X-Car coasters, a third one will follow at Parque de Atracciones in Spain next year. 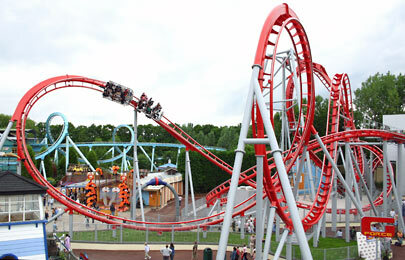 What is the feedback from the parks and the riders so far? 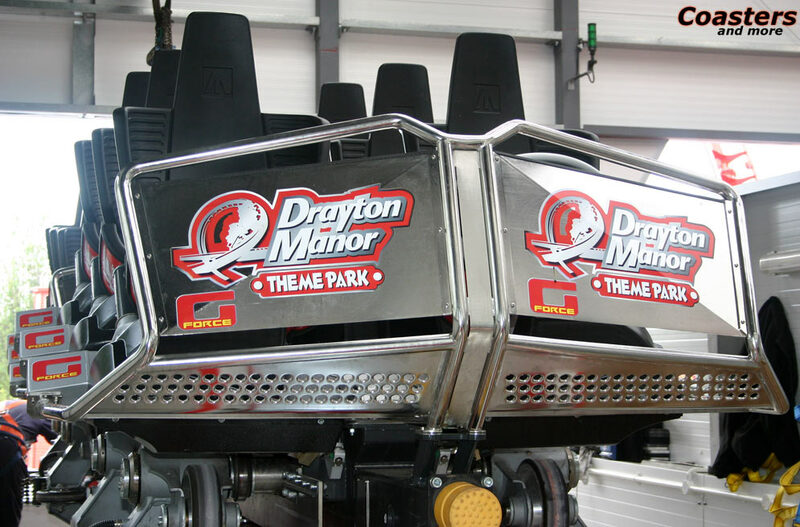 The feedback from Skyline Park as well as Drayton Manor is excellent so far, and the riders are enthusiastic. Especially Skyline Park reports increased attendance. The X-Car has a very high technical standard. Of course we are anxious to further improve the product. We take proposals from riders very seriously and thoroughly analyze potentials we can derive from them. How do you judge the response from potential customers? You have received a high degree of attention at several trade shows, last but not least because of the elaborate booth, as well as a couple of awards. Does this show in concrete negotiations? The response of potential customers is very positive. The X-Car is contained in many masterplans, with a range from moderate to very thrilling layouts. 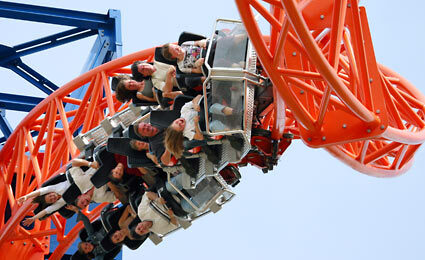 We are sure that the broad spectrum of possibilites will be represented by future X-Car coasters. 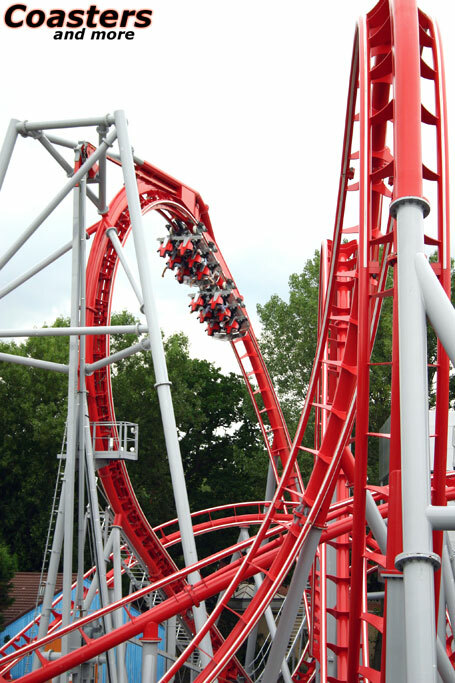 How do you assess the current market situation - is there a further trend towards compact, unusual layouts or will the next years belong to launch coasters? The multitude of different systems will further increase. This was the main reason for giving the X-Car as much variability as possible. With this platform we can satisfy a wide range of requirements, including a launch. We see a trend towards budgets getting ever smaller for new rides. We see the X-Car quite well positioned in this regard, too. In which direction will your layout designs go in the future? The variety is almost unlimited with the X-Car. 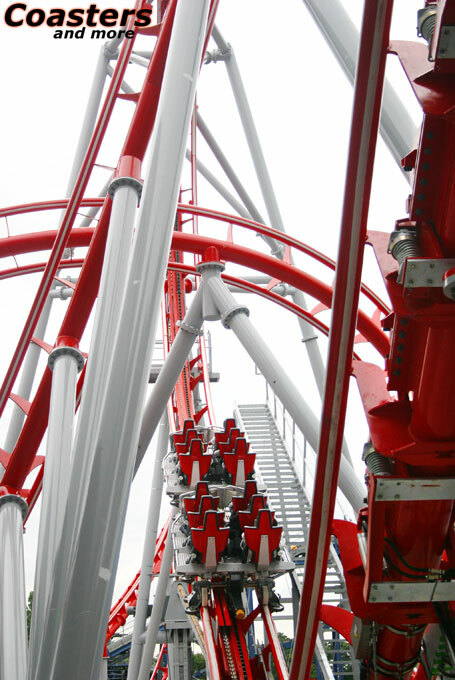 New ride elements are being included in almost every new layout we design. For us it is important to emphasize the special strengths and new possibilities of the X-Car, so all layouts will be different from the usual designs known so far. Are there any other sales except for the ride for Madrid you can tell about? Recently the first SkyWheel was sold to the US. 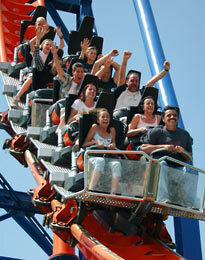 The ride will open at Magic Springs and Crystal Falls Park in Hot Springs, Arkansas in May 2006. The interview was held by Dipl.-Ing. 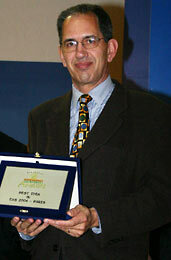 Jochen Peschel.